I don’t remember exactly how I came across the recipe for these Pistachio Cookies, but so glad that I did. Pistachio Cookies are the type of little morsels that with one bite let you know that everything is right with the world, if only for that special moment. A delicate bite of ground pistachio flavored with lemon and vanilla, what could be wrong with that? The original recipe, Sicilian in its origin, is from the Rome Sustainable Food Project of the American Academy in Rome. The project is dedicated to providing local, sustainable, organic meals to the American Academy community. Cookie aficionados, their cookbook Biscotti is a must and makes a great gift as well. Pistachio Cookies require few ingredients, as the recipe focuses on the essence of quality ingredients. The cookies are rather simple to prepare, requiring only a food processor to do the work. Pistachio Cookies are dairy and gluten free as they are naturally meant to be. 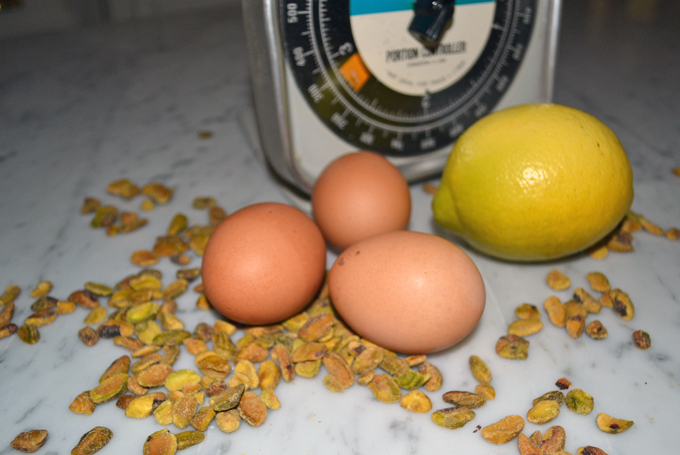 The sweetened ground pistachio meal is merely held together with just a few egg whites. These are the perfect way to end a lovely meal as I have done over and over again. Naturally, a nice espresso and perhaps your favorite Grappa wouldn’t hurt. Subscribing to La Bella Sorella is easy, just submit your email in the space below. Preheat the oven to 350º F, arrange the racks to the top third and middle sections of your oven. Line two heavy-duty baking sheets with parchment paper. Place the 4⅓ cups of pistachios in the work bowl of a food processor with ½ cup of the granulated sugar. Pulse until the pistachios are finely ground, but be careful not to turn the nuts into a paste. Add the remaining granulated sugar, honey, and lemon zest to the work bowl and process only until combined with the ground nuts. Slowly add the egg whites to the work bowl through the feed tube as the food processor is running. Once a soft, not sticky, dough has been formed, stop and turn the mixture out onto a work surface or plate. Have the pistachio pieces and sifted confectioner's sugar alongside the dough & prepared baking sheets; begin to form the cookies. Taking small pieces of dough, about the size of a small walnut and roll into a ball. Roll the newly formed balls of dough into the confectioner's sugar to thoroughly coat and place on the prepared baking sheet about 1¼ inches apart. Once the cookies have been formed, take a pistachio and gently press it into the center of the dough. Place the baking sheets into the preheated oven and bake for 15 to 18 minutes or until the edges are lightly golden. Midway during the baking process, reverse the trays onto opposite racks and turn the sheets from back to front. Remove the baking sheets to a rack to cool. Oh thank you so much for this recipe. I have a lot of pistachios waiting to be used in something wonderful and I think I found it!! I am so happy to hear that, they make a nice addition to the holiday cookie platter.